The objective of the game is to become the first team to score 500 points. There are three classes avilable to chose. You can re-pick your class anytime you respawn or use the elite skill to port back to the entrance. Supporters control areas of the battlefield and assist their allies. Throw Snowball: A quick, basic attack. Tracks your target. Healing Breeze: Heal yourself and allies in a cone in front of you. Allies gain regeneration. Icy Ground: Create a patch of slippery ice. Causes enemies to fall down. Ice Wall: Create a wall of ice that blocks enemies and projectiles. Allies can interact with the wall to pass through it. Snowroll: Roll around as a giant snowball and knock back enemies. Heavy Gunners take and deal a lot of damage. They can only attack once they’ve drawn their weapon, which has the double effect of slowing them down and granting them passive health regeneration. Draw Rifle/Fire Snowball: Draw your gun and fire a basic snowball attack. Powder Spray: Fire a cone of snow that chills and damages enemies. It can also repair a supporter’s Ice Wall. Jump Shot: Use your snow rifle to blast yourself toward a targeted location. Overcharged Shot: Fire a giant, exploding snowball that launches enemies backward. Defensive Bubble: Create a bubble that knocks back enemies and deflects snowballs. You can still use Fire Snowball while using this skill. Scouts are infiltrators and assassins. They are the fastest class and can use stealth. Additionally, the scout gets a damage bonus when hitting enemies from behind. Quick Shot: Fire a fast, basic snowball shot. Evasive Shot: Leap away from your target, evading damage, and launch a crippling snowball. Rapid Fire: Fire a barrage of snowballs at your foe. Snowballs have a better chance of hitting your target in close range. Sniper Shot: Charge up a long-range shot. The longer you charge, the farther and faster the snowball flies and the more damage it deals. Snowblind: Vanish in a puff of snow, blinding enemies and granting you stealth. Your #6 skill is determined by your real open world profession. Elementalist Summon Ice Elemental: Summon an ice elemental who follows you and fights with you. Necromancer Frostmark: Create a mark on the ground that causes a chain reaction of frost novas when triggered. Mesmer Clone: Summon a clone that wields the same weapon as you, even a Wintersday gift bundle. Engineer Snowman Turret: Build a snowman turret that fights with you. Detonate the snowman for additional area damage. Ranger Snowball Trap: Place a trap that launches a volley of snowballs toward its center when triggered. Thief Icewurm Venom Trap: Place a trap that freezes enemies in place when triggered. Warrior Rush: Rush at your target and knock it down with a powerful kick. You will reflect snowballs while rushing. Guardian Slingshot of Understanding: Summon a slingshot spirit weapon to fight with you. You can command the slingshot to fire a volley of snowballs at your target. Throw Snowball: Basic snowball attack. Icy Ground: Create a patch of icy ground around yourself, causing enemies to slip and fall. Freeze Beam: Channel a beam of cold energy at your target, freezing them in place. These power ups can be found all over the map. Damage Boost: All of your attacks deal extra damage. Speed Boost: Your movement speed is increased. 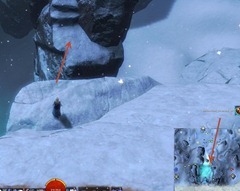 Piercing Shots: Your snowballs travel through targets, allowing you to hit multiple foes. Skill Recharge: Your weapon skills recharge faster. Health Regeneration: Your health is restored over time. Everytime you bring a gift from the center of the map to your base, your team get 100 points. Everytime you kill someone in the opposing team, your team get 5 points. In terms of personal score, everytime you bring a gift back to your base, you get 10 points and everytime you kill an enemy player, you get 3 points. If you stop a gift carrier from the opposing team, you get 2 points. 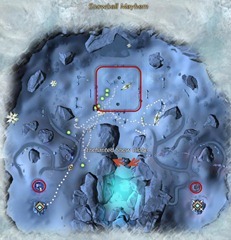 Here is a map of Snowball Mayhem. The large rectangle at the top indicate the rough area where the gift will spawn while the two smaller circles at the bottom indicates the gift drop off points. Map Shortcut: There is a shortcut that allow you to get from your base to the enemy base and vice versa. You will need to make this jump here while not in combat (it is a fairly long jump). There is usually a power-up located on the middle rock as well. All classes: Autoattack with your 1 ability is not enabled by default, press ctrl + right click on that skill. Support: If you just downed someone, activate Snowroll and repeatedly run over the downed enemy. The snowball does a lot of damage to downed players and can finish them off quick. 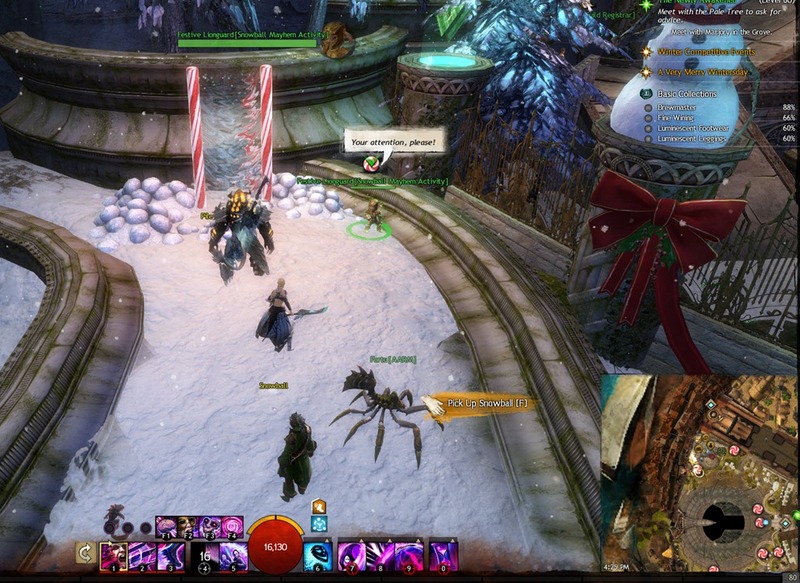 Scout: You can activate your Snowblind ability near the gift carrier of your team. This will cloak both you and the gift carrier for a few seconds and give you both swiftness. Scout: Scout is the easiest class to get the gift. Just activate Snowblind at the start (#5) as this will give you swiftness. Then use that to get the swiftness power up. Once you reach the gift, use Snowblind again. Scout: You can camp near the enemy base and if you see an enemy gift carrier coming, hit Snowblind and then activate Sniper Shot as soon as the carrier is in range. If you get Sniper Shot channel for the whole duration, this will hit them for 80% of their HP. 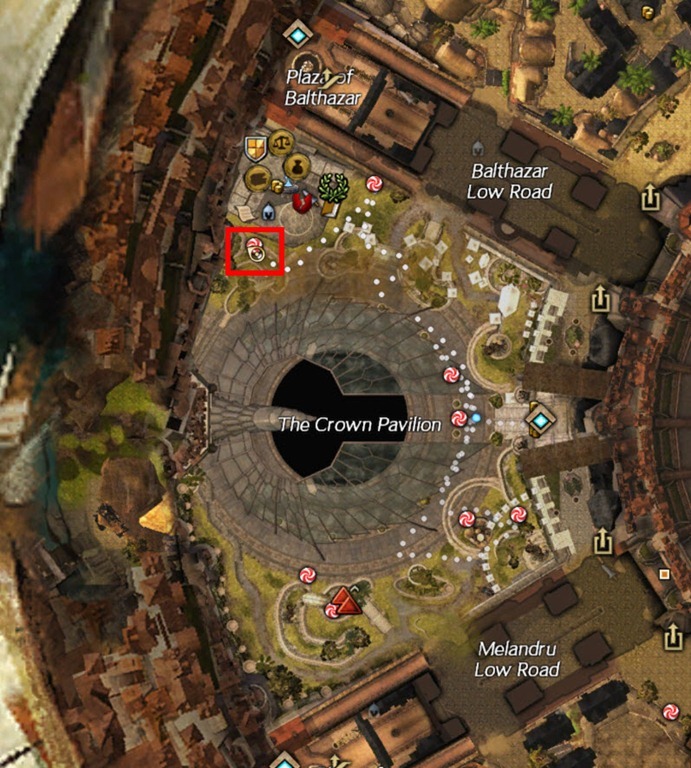 You get 1 Wintersday Gift everytime your team score. You get 3 Wintersday Gifts at the end if your team win the match. Really didn’t enjoy this game at all. Entire opposing team went scouts and set in the center as a zerg. Had no chance. It seems as though every single person who joins is put on only one side. And since people join and leave rather quickly, this almost leads to a steamroll. I played 8 games and every time i was on the other team it was full stacked and we won by 500 points. Its ridiculous. Lucky, everytime I join, it’s always a game tat’s already started and I’m on the losing side. Or I get lucky and get into a fresh match and if I go for the present, my team is busy PvPing at our base and I have no back up.No choice but to ask for a premade of my guild but no one wants to play Snowcrap mayhem. I wouldn’t even go in there if I didn’t need 3 wins and if I ever get them, I’ll never go back again, which is probably alot of peoples thought process who don’t pvp let alone enjoy being forced to pvp several times to get an achievement to get an achievement to get an achievement to get a single flippin item to unlock a schematic to make a damn item. Geezis. .